Citroën C3 Picasso Boot Space, Size, Seats | What Car? 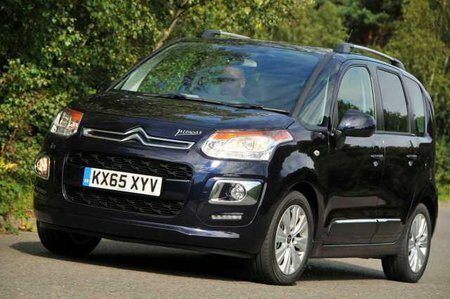 The C3 Picasso is only slightly longer than conventional superminis, but it’s a lot roomier inside because the high roofline allows more upright seating. You won’t struggle for space in the front, as a result, and there’s plenty of room to stretch out and get comfortable. The big standard-fit panoramic roof and excellent forward visibility bolster the bright and spacious feel. You’ll find plenty of oddment storage dotted around the cabin as well. Platinum versions also get a front driver’s armrest, which improves comfort on longer trips. It’s easy to get into and out of the Citroen, too, thank to tall doors that open wide, and large, flat footwells. There’s plenty of room for adults in the back of the Picasso, thanks again to that high roofline. They won’t struggle for leg or knee room, either, and the flat floor means the central passenger is far more comfortable. The seats can be slid backwards to increase room at the cost of boot space, granting you more passenger room when necessary, and this feature is standard across the range. All versions feature three retractable rear headrests as standard. Both Edition and Platinum models also get the Spacebox+ Storage System, which adds rear underfloor storage, rear sunblinds and fold-down tray tables, improving comfort and practicality. As with the front, rear access is good thanks to doors that open wide. You get a comprehensive range of seat adjustments as standard in the Picasso. A height-adjustable driver’s seat is standard on all versions, as are split folding and sliding rear seats. The sliding rear seats allow you to increase rear seat space or boot space depending on your requirements, which is useful. No version has a height-adjustable passenger seat, however, but it’s unlikely to prove a huge problem due to the upright and otherwise adjustable seats. Boot capacity ranges from a generous 385 litres to an estate car-rivalling 500, depending on where you position the rear seats. The rear seats can be folded quickly and easily, increasing the available storage space to a whopping 1506 litres. The rear seats can also be removed altogether, for maximum load-carrying capability. A height-adjustable boot floor is standard, and grants a flat load bay with no lip in its highest position. All versions get a rear parcel shelf for improved security.